During Sandhill Crane migration, 500,000 cranes coming from Mexico and the southern US stop in Kearney, Nebraksa every spring, to fatten up for the send leg of their trip to Alaska. 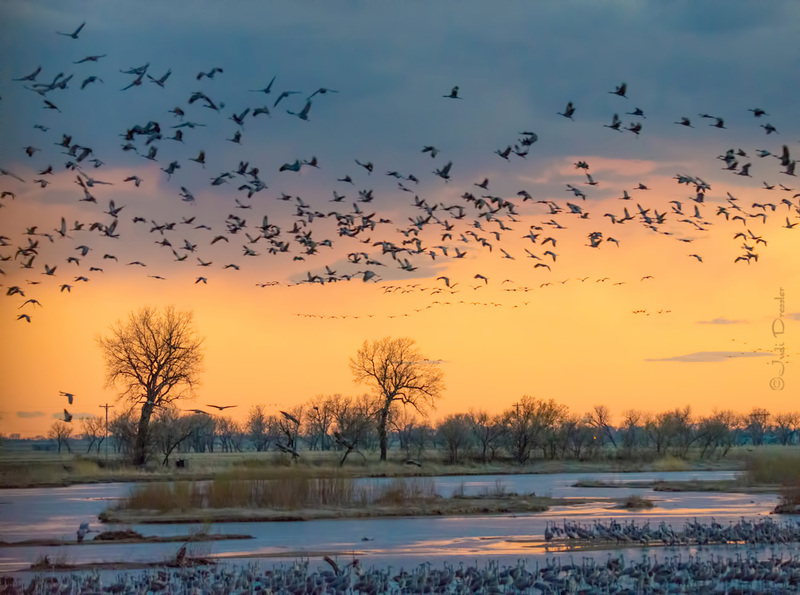 When the sun goes down, the cranes return from the corn fields in groups to spend the night at the Platte River, where they are safe from predators. One can see 5,000 to10,000 cranes at once, but the most magical part is the sound, as they call their prehistoric call, on and on, calling and calling to each other as they fly in and settle down for the night. It is pure magic. I took this photo in the spring of 2016 in Kearney, NE.